In the last couple months, I’ve been inundated with questions from parents both online and during my Parent Seminars about the game Fortnite. There have been numerous blog posts written and also shared on social media and stories on popular news and TV programs suggesting that families were being ‘destroyed’ by Fortnite and that boys, in particular, were being harmed by their Fortnite ’addiction’. One Facebook post alone garnered over 60,000 comments regarding whether kids were ‘addicted’ to the game. This type of scaremongering has caused many parents concerns. 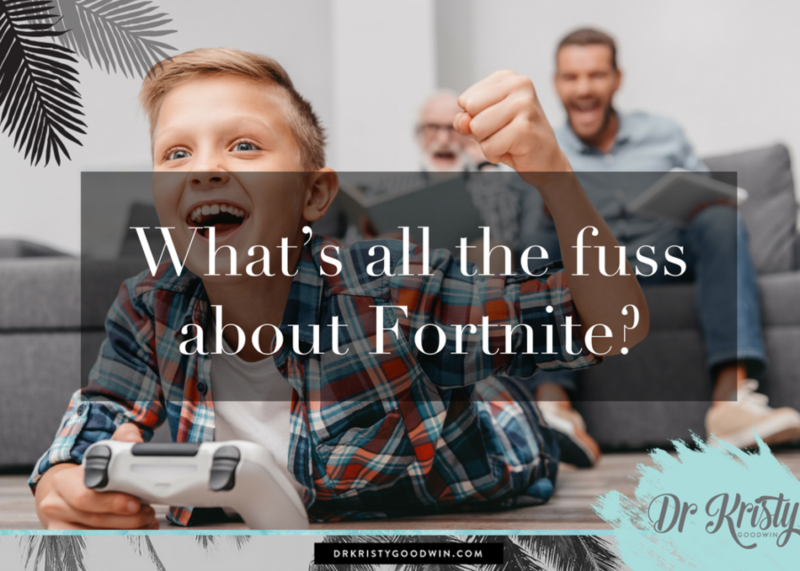 So in this blog post, I want to arm you with facts, not fears, so that you can make an informed choice as to whether Fortnite is a good fit for your kids and family. I’ll also arm you with practical, realistic tips so if your family elects to use Fortnite, you can do so in a way that doesn’t compromise your child’s health and wellbeing. Chances are that if you’ve kids aged between 6 to 16 years, they’re asking for (maybe even begging or pleading), or perhaps even playing Fortnite. Fornite Battle Royale (which is the version of the game your child wants to play) is a multi-player shooting game where up to 100 players simultaneously play. There is another version of the game (probably the version of the game your child hasn’t asked for) called Save the Day where they play by themselves in solo mode. In its simplest form, Fortnite is a shooting and killing game. The purpose is to literally survive by killing other players- be the last person standing and you’re declared the winner. In order to win, players need to build infrastructure to protect themselves and accumulate additional weapons to attack. Unlike other shooting games, with Fortnite Battle Royale, once you are dead, that is it. You cannot be ‘respawned’ nor given a second life, as is often the case in other games. However, the violence is significantly less graphic than other shooting games which many kids and adolescents are playing (for example, World of Warcraft, Grand Theft Auto V, Sniper Elite 4 and Resident Evil 7 Biohazard). This is in part due to the cartoon depiction of characters (in some video games the graphics are so sophisticated and life-like it’s sometimes difficult to recognise their animations) and also to the violent scenes shown in the game (there’s minimal on-screen distressing content). It’s estimated that up to 40 million people are playing this game worldwide. Whilst it is essentially a ‘free’ game, there are of course additional purchases that can be made. (I know one Mum who confessed that her son used her credit card, the details of which are conveniently saved in the game, to purchase $237 in additional ammunition). The ‘free’ element is obviously appealing to many kids. Players can unlock new items as they progress in the game, without paying anything (which can of course add to the ‘obsessive’ nature some players develop). However, players can purchase a ‘Premium Battle Pass’ to gain access to exclusive clothing and items and again your performance and ongoing participation in the game is rewarded with more options available in the shop. The playful humour and cartoon-like characters are also appealing. Players can engage in dance moves in the game, making it quite light-hearted and fun. Some of these dance moves have transferred off-screen and have ‘gone viral’ with most parents having seen (maybe even attempted) the ‘floss’ (which is the 2018 equivalent of the ‘dab’ I am told). This social appeal makes the game even more appealing and adds to the social capital that the game has cleverly established (English soccer players were recently seen talking about the game at the Soccer World Cup). It can also be played on a range of devices- Computers, PlayStation, Xbox and smartphones, meaning it can and is literally played anywhere, everywhere and at anytime (I’ve had kids tell me they’re playing Fortnite in their Geography lessons). Again, the ease of access has resulted in its appeal and widespread adoption. However, it’s the multi-player aspect that’s really why this game has had mass appeal. Kids are biologically wired for relational connection. They want to feel like they belong and playing in this online, interactive format, is socially appealing. Many kids have also started to form teams or groups to play as either a duo or squad. When they’re playing with their peers, there’s a sense of comradery and this social allegiance makes it a very difficult game to switch off. “Mum, I’ll let my team down if I turn it off now,” is a phrase many parents hear when they request that their child switches off. Again, this social appeal is very strong amongst kids and teens. What do parents need to be aware of? The most common complaint I have from parents relates to concerns that the game is ‘addictive’. There are compulsive loops built into the game, making it more enticing to keep playing (for example, you can unlock more features and purchase additional items in the shop, the longer you play). Fortnite also offers intermittent rewards. Statistically, kids will lose more than they’ll win, but that elusive win, the adrenaline rush that they get from almost winning, is what keeps the enthralled and wanting more and more. This creates the state of insufficiency where players never feel like they’re ‘done’ and rarely feel satisfied with their performance. I shared a post on Facebook recently (of another blog post that adopted a scare-mongering approach) and I was inundated with personal messages from people telling me that their child was ‘addicted’. Whilst I don’t want to get bogged down in the scientific explanations of Internet addiction (discussions around substance versus psychological addictions warrant another blog post), I want to say that in most instances it’s unlikely that kids would be ‘addicted’ to the game, if applying medical, diagnostic criteria. The research tells us that only a very small percentage (<3% of kids would be considered as having a recognised ‘gaming addiction’). Instead, it’s much more likely that kids have formed some obsessive or problematic behaviours when it comes to playing Fortnite. I suggest that we see kids’ problematic behaviours as a digital dependence or an obsession, rather than labelling it as an addiction (which is a very loaded term). Whilst most Fortnite games last for between 15-25 minutes, some games can go on for longer periods, depending on the skill level of the player. However, after finishing one game, with so much adrenaline pumping through their bodies, or perhaps they were close to winning the previous game, players tell me that it’s incredibly hard to stop after one game (I feel the same way about hot cinnamon donuts…one is never enough). It’s also very difficult for players to stop mid-way through a game, as they’ll literally die. So a simple strategy here is to give your kids ample warning before they switch off the game, so that they can complete a full game and not be forced to terminate mid-way in the game. As with all multi-player games, there are potential risks associated with kids being subject to cyber-bullying or being groomed by online predators. There is a text chat function in Fortnite, but it’s rarely utilised by players as they find it too distracting to type and play simultaneously. Instead, many players engage in the voice chat function (which means that playing the game is often very noisy… which can be a good thing as it means it’s unlikely that your child will try and play it in their bedrooms when they’re supposed to be doing homework). However, I’ve had multiple parents telling me their child has encountered verbal abuse in this chat function. We also can’t shy away from the fact that it’s a violent game. It’s a shooting game and other players are killed. Some child development experts argue that boys are biologically wired to be mammoth-hunters and that playing these gains caters for this innate desire. As I mentioned earlier, the cartoon-like graphics are nowhere near as confronting as some other shooting games that kids and adolescents play where they graphics are so sophisticated that it’s sometimes difficult to ascertain the difference between fiction and reality. However, Fortnite is still a game that promotes violence. Families each need to use their own moral compass as to whether this is something they’re comfortable with and also determine if their child has the emotional resources and maturity to process such content. We need to remember that kids have mirror neurons meaning that they are wired to imitate. So for younger children, typically under eight to ten years, who are still learning to distinguish fiction from reality, playing these types of shooting games can be problematic as they copy what they’re watching and playing. We need to ensure, regardless of their age, that we have ongoing conversations with kids and teens about appropriate and socially-acceptable behaviour off-screen. Despite the doom and gloom that Fortnite attracts, it’s important to note that there are in fact some positive benefits associated with kids playing Fortnite. Unlike watching TV or YouTube, playing Fortnite requires interactivity and engagement. Kids will engage in problem-solving and other higher order thinking skills such as collaboration, hypothesising, evaluating to participate in the game. They’ll have to constantly evaluate their strategies and deploy better plans, based on their observations and experiences. Given that most kids prefer to play in multi-player mode, chances are they’re interacting with their peers, or other people. (I also acknowledge this can be dangerous if they’re interacting with unsavoury people or being exposed to inappropriate language or concepts in voice chats). Kids are not only playing the game together but they’re often spending their face-to-face social time discussing and dissecting the game and sharing tips and insights. This social collaboration is something we need to foster. What can parents do to keep kids safe and healthy playing the game? Set limits– give kids quantities in terms of the number of battles they can play, instead of prescribing an amount of time they can play. “You can have three battles today and then I want you to turn it off.” It’s impossible to ‘pause’ the game, as many parents have found out, so prescribing time limits is often met with frustration as kids can be almost at the point of victory and you demand that they switch it off to come to the dinner table- no wonder they’re frustrated! Use parental controls– Xbox, PlayStation or Switch devices allow you to use parental controls to limit the length of gaming sessions. You can even ban them from the game completely if you’ve realised it’s not a good fit for your kids. Turn off voice chat– if your child is still in primary school I strongly advise that you don’t allow your child to have voice chat. Some of the conversations are age-inappropriate and introduce language you don’t want your child exposed to. Young kids also lack the social maturity and skills required to have these verbal conversations. Encourage your child to play the game in publicly-accessible areas in the home. Not only does this help you moderate and manage how long they’re playing, it also makes it easier to check that they’re not being harassed or groomed online. Play with your child or at least show an interest– kids love it when their parents or carers show an interest in their online pursuits. It shows them that you value what they’re doing and also helps to subtly remind them that you’re there to help should they hit turbulence. If parents are completely disinterested, or on the other spectrum if they completely prohibit these games, it can often drive behaviour underground. Restrict access at night and before school– this game can really hyper-arouse kids’ and teens’ sensory and nervous systems making it challenging to fall asleep or stay focused at school. If they’re playing at night before bed, it can cause sleep delays (both from a brain that can’t slow down and also from the blue-light emitted from the device). Also, we know at night that kids’ and teens’ prefrontal cortex stops working (this is the part of the brain that helps to make logical, smart decisions) and instead their amygdala turns on (this is their emotional brain) meaning they’re much more susceptible to making careless choices and engaging in risky behaviour at night. Have ongoing conversations about violence and cyber-safety. These are not one-off conversations. You need to have them often as the technology and threats keep changing and your child or teen’s brain is still developing so their memory-making skills are still developing (their prefrontal cortex which helps with working memory isn’t fully developed until late 20s for males and early 20s for females). Like any new fad or phase, it’s highly likely that this too shall pass. Another new game or social media app will come along in due course and supersede Fortnite. In the interim, hopefully you now feel better equipped to make informed choices about how you handle the ‘F’ word in your house. The World Health Organisation has recently recognised ‘gaming disorder’ as a psychological condition. However, there are many scientists, researchers and academics who disagree with the WHO decision claiming that it’s simply fuelling moral panic by pathologising a behaviour that isn’t necessarily ‘harmful’ in most instances. Again, this is a topic for broader conversations. Thank you for a great balance of info. I was at the hairdresser one day when a lady told me how she restricted her son but he ended up stealing her cc and then his siblings cc to make up for the fact that he wasn’t allowed the time to play and build up his armour. As you said, it’s social too so I guess being too restrictive causes other issues. I’m glad it helped. Yes, banning devices often drives behaviour underground and causes it to become like ‘forbidden fruit’. I seriously love how you break it all down and help parents turn on and into our own power when it comes to raising kiddos in this digital age. Thank you friend! Hi Kristy-thanks for a balanced article. As a parent I have been grappling with Fortnite-as “all” my sons friends are playing. However, as a researcher (in adolescent mental health)-it spurred me to research it. My child ‘feels big’ and has had some low level anxiety, and his behavior after “Mindcraft” made me cautious. So, he has limited screen time, but that he does is based on constructionist games and those that will promote some emotional and spatial memory and we can all play. (e.g SuperMario ), and yes, some mindless Youtube (I am far from perfect!). However, I have drawn the line at Fortnite. My only really concern is that he is ‘missing out’ on what his peers are doing. So I am trying to encourage his friendships in other areas such sport . But also we are having the early conversations about peer pressure, which is important (and I think this game has generated a lot of in all his peers, as parents say they don’t necessarily agree with the game, but don’t want their child to ‘miss out’). Unfortunately the game itself is not ‘harmless’ as other parents seem to say. It is 100% designed to get people in the ‘flow’ and create uncertain rewards for dopamine hits. An interview with a psychologist who designs games, said there is no doubt it is aimed for kids as young as six, not the 12+ age as prescribed, due to the colorful graphics, costumes and attitudes of characters. Younger age at exposure is a risk factor for problematic gaming. Micro-transactions exist in the game, and these are also cause for concern when kids don’t have access to credit cards,create a tension between parents and kids, and also creates an early association with credit, without any financial literacy or capacity for understanding credit. I will give credit that creators of Fortnite removed the loop boxes from this game as there is a very blurred line between these and gambling,so much so that European countries are beginning to ban loop boxes from games. This then there is the notion of stylized violence. As you articulate, it is still violence. And violent video games have been shown to be associated with aggressive and antisocial behavior in numerous studies including social sciences, psychology and neuroscience. Finally there is not much longitudinal research in this area, especially at this young age. One recent study has shown that gaming does have a casual relationship with developing anxiety and depression (other studies that are cross sectional have shown it can go both way). This was with a cohort of those adolescents classified at IGD, and in recognizing that bias, they recommended population wide studies. A project in my organisation is collecting longitudinal data including gaming behavior. Approx 5% of the population would be considered ‘problematic gaming’ and a very close match to prevalence data of 5 % worldwide with IGD, but of interest there is also an additional group of the cohort (~10%) that would I categorize ‘at risk’, from the number of hours, the frequency, the games they are paying and multiple platforms they are using. The accessibility and portability of Fortnite have seen this become the preferred game by far, very quickly. The project is only just beginning to collect data on Fortnite, so it is not unexpected to assume the numbers playing will rise, at risk behaviors to be more prevalent, and (I am speculating here) associated behavioral issues to increase in a younger age bracket. One issue that you did not touch on in this article, is the associated additional screen time that kids then want to do to watch YouTubers ‘playing’ games, especially Fortnite (but also Mindcraft). They do this to learn tips and tricks for playing, but also they want to watch these pro-gamers just talking because of who they are,giving the gamers a celebratory status. Given screen time is associated with alot of developmental and behavioral issues, this cumulative use of screen time from gaming, tv, internet use and Youtube all needs to be considered in a young cohort (Generation Z and Alpha) in relation to impact. Finally , for me, on of the key concerns is the notion of ‘predatory’ gaming design. As a younger age of playing is also a risk factor for problematic behavior, this is a concern. I think we are probably 3-10 years away from seeing what real impact gaming will have on these generations in terms of their neuro, behavioral and socio-development, and what will happen in relation to those gamers that will go onto be gamblers, and/or those that develop associated behavioral and mental health issues and/or those that actually do develop IGD, or other addictive behaviors. As a public health practitioner and parent, I actually think associated health issues from ‘screen time’ will be the epidemic of the future. I think parents should make up their own minds, and hopefully they can do it based upon research without hysterics, and as you said blaming parents is pretty harsh. Life events, busy lives, and traumatic events such as divorce of parents, schoolyard bullying or family traumas happen to families and these events can lead kids to these cyber-spaces to feel safe and confident. These games are not innocent, they are designed to make money and to ‘hook’ people, that’s how they are designed. This happens with adults who have fully formed brains and rational decision making capacities, so kids need much more help from parents. So it is much broader than just ‘turn it off’ or ‘bad parenting’. In this day and age parents had so much pressure already, that they need to feel supported not vilified for their decisions, when they area probably just doing the best they can. As you said, there is not rulebook for this phenomenon and we are all doing the best we can. Lets hope information can help people with their decisions and to feel supported, and to support each other even if we don’t agree with each others choices.